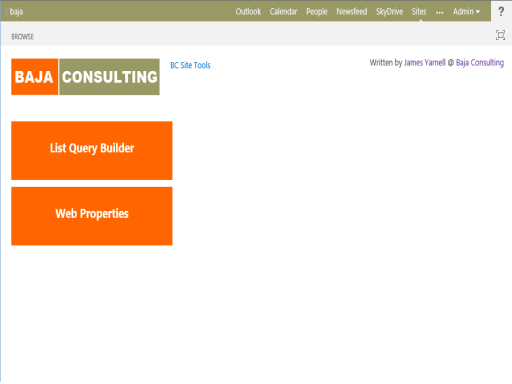 Baja Consulting is now live on SharePoint 2013 on Office 365. After waiting months for our old tenant to be upgraded, we decided to simply cancel the current subscription and sign-up again. Because of that, everything is brand new (including blog), so we apologize for anyone that got a bad link from a search engine. For anyone that chooses this approach also, the only major thing that we ran into was Lync Federation. Others on Office 365 federated immediately (or pretty close), then after about 12 hours customer federation started working and finally Skype and MS Messenger contacts started working after about 36 hours. Changed List Query Builder by adding a dropdown to select the type of generated code and removed the corresponding buttons. Added the ability to generate Knockout from the List Query Builder. Designed as a Data View replacement to allow designers to easily select data from lists and simply modify the generated HTML to render views. 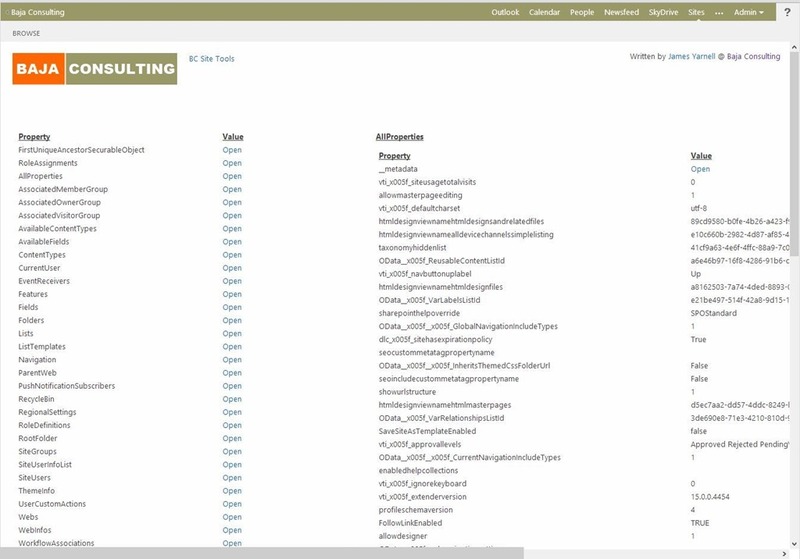 Displays all of the available properties that are returned from the REST / OData call for the current web. 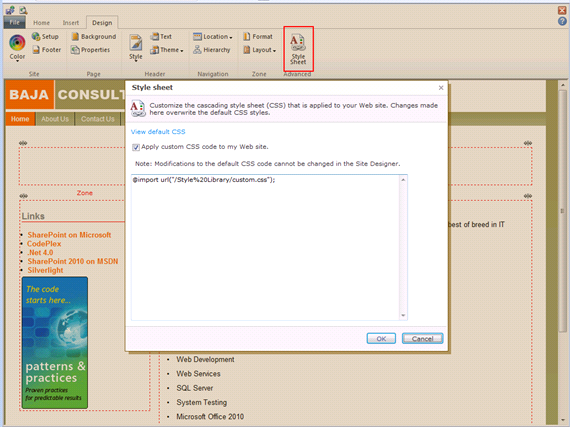 The pages in the application use the SharePoint Client Object Model and the OData interface to dynamically build the information. Some of the fields and pages that are dynamically called either return errors or return nothing. These fields and pages exist but require alternative access methods. Currently, this is by design. I know I promised this post a long time ago but thankfully I have been very busy. 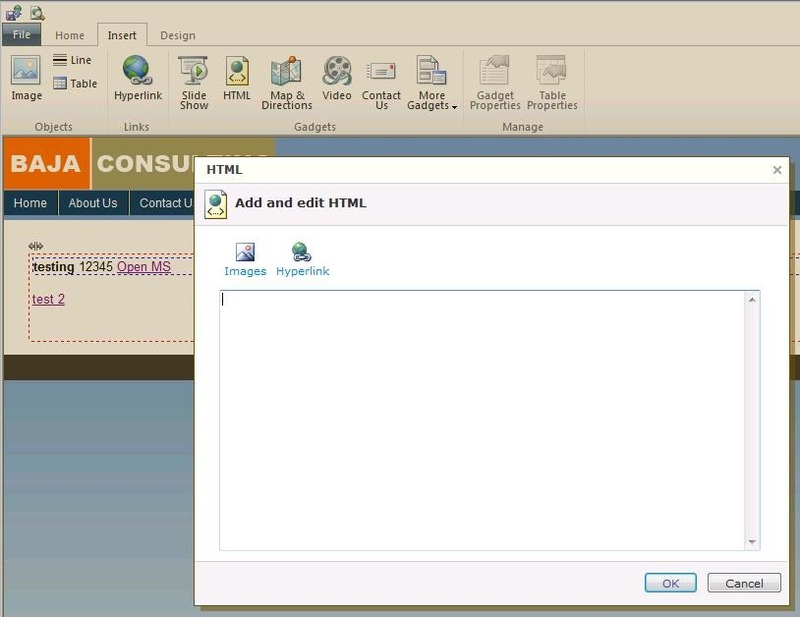 The reason I started looking at the HTML part was to insert JQuery and my own script into the page. Being asynchronously loaded into an Iframe meant no real help when it came to modifying elements on my page. So I started searching elsewhere. 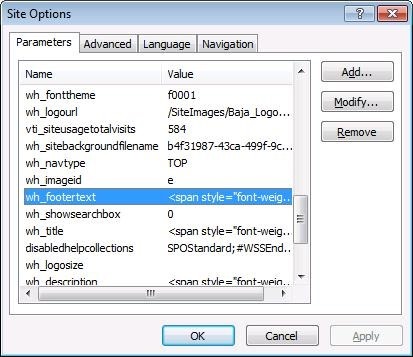 I then stumbled on the Site Options on the Site ribbon in SPD. These values are really there for adding consistent information throughout the site but work very well for including anything as it does not appear to be validated in any way. Well in my last post I promised to write more about the changes I have made to www.bajaconsulting.com but before I could I got accepted into the Office 365 Beta program (http://www.microsoft.com/en-us/office365/online-software.aspx) which of course includes a small business public web site based on SharePoint 2010. I could not have been happier and jump right in to make the same changes I had just made to my new static site on the SharePoint site plus add some cool new stuff that only SharePoint 2010 could supply. The first thing I did was start changing the page layout (through the GUI) to look the way I wanted it. I put the menu at the top of the page and added my copyright information to the bottom. I was on a roll!! Pulling list information from a SharePoint list (here’s a hint, the REST apis do not work anonymously) – Workaround found. Post coming but the Specialties uses this too. I know I assumed the readers know SharePoint 2010 here, so let me know if I went over anything too lightly. More to come on what I have already done and as new things emerge. All data and information provided on this site is for informational purposes only. 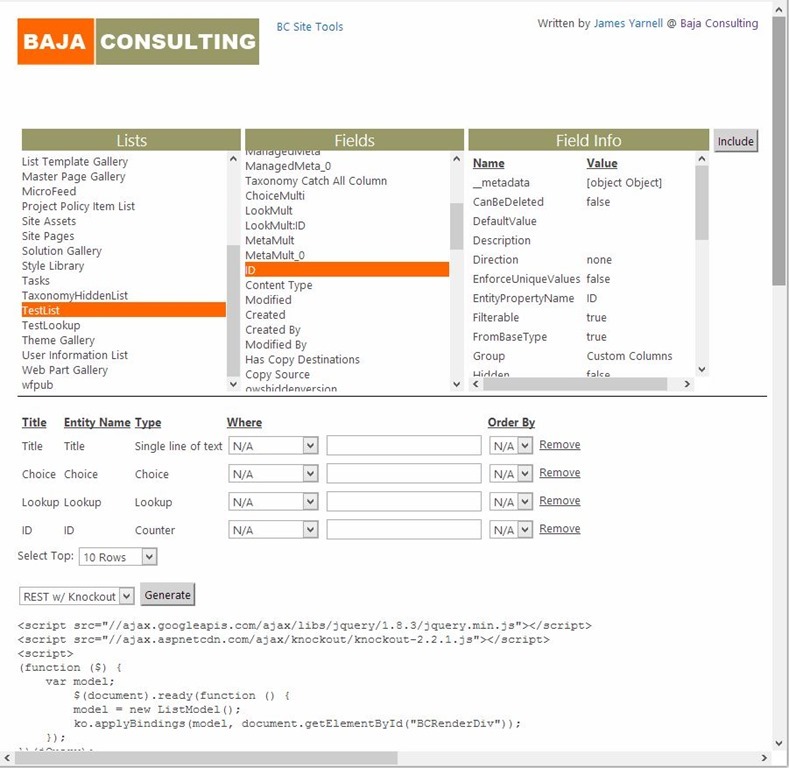 Baja Consulting LLC or any poster makes no representations as to accuracy, completeness, currentness, suitability, or validity of any information on this site and will not be liable for any errors, omissions, or delays in this information or any losses, injuries, or damages arising from its display or use. All information is provided on an as-is basis and confers no rights.